There are three sets of 75t boiler (1#, 2#, 3#) and three sets of 220t boiler (4#, 5#, 6#) in the thermal power corporation of a Chinese factory. All boilers are equipped with ID fan, FD fan, SA fan. Motors are designed according to the maximum load. However, usually the boilers are not fully-loaded, but just about 2/3. Thus, the actual flow the boilers demand should be adjusted with load changing. To meet the need, generally we adjust the opening of the damper, which cannot adjust the speed of the motor so that the energy are wasted and cost rises. To reduce the cost of manufacture and energy waste, and to accord with requirement of low consumption, low emission and high efficiency, AC drive is needed in technical reform for improving the work and saving energy. We have achieved a very good effect and experience through the application of LV AC drive. With the MV AC drive improving maturely, we put the perfect technique into MV AC drive. In May 2006, we reformed with MV AC drive for three motors of 4# boiler. The bypass circuit is composed of 3 medium voltage isolator switches QS1, QS2 and QS3 (as figure 1, in which QF is the original medium voltage switch). 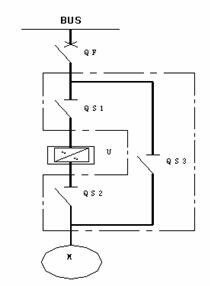 QS2 and QS3 can not close together and they are interlocked mechanically. When the motor is driven by medium voltage AC drive, QS1 and QS2 are closed and QS3 is open; when the motor is in direct on line, QS3 is closed and QS1 and QS2 are open. For the purpose of protection, AC drive is link locked with the switch QF. Once medium voltage AC drive faults, QF switches off. 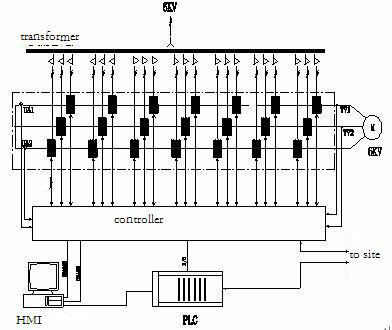 It requires user to make suitable change in the switching circuit. During bypass operation, medium voltage AC drive will allow QF switch-on and cancel the switch-off signal to enable the motor to start in direct on line. Gozuk provides three modes, local control manually, DCS close loop automatically, DCS open loop manually. As the process of AC drive is AC-DC-AC, there is some heat radiation (2%). The heat heightens the temperature of AC drive, even burns it down. For stable operation, AC drive should transmit the heat timely. Heat radiation of medium voltage AC drive is important for operation. According to the study, we take air-cooling which is the simplest, the most effective and stable. It needs to install duct on top of AC drive which could bring the heat out of the room through cooling fan on top of the AC drive. Only duct is needed without any other rotating devices so that it is reliable and less fault point. Through fully-load test in the room 40℃, maximum point of AC drive is 68℃, which is quite ideal contrast to the design value 140℃. After the reform for fans, the damper which used to adjust the flow is fully-opened. Resistance loss is greatly reduced. In addition, as the motor operates in V/F mode in which operating frequency varies so resonance is avoided. It is unexpected that the problem of pipeline cracking is solved. When motor starts in direct on line state, its starting current might be 7~8 times of rated. The peak current would increases the electric stress of the windings and leads to additional heat so that the motor's lifespan reduces. After the reform, soft-start becomes a reality by which motor current starts from zero speed/voltage (torque lifting is available) to work current. The load driven by AC drive operates in V/F control mode or vector control mode, hardly impact on the grid. By AC drive, the motor usually runs in range of 30~40Hz. It reduces the speed of fan contrast to line frequency. In addition, soft-start could prolong the lifespan of spare parts, insulation and shaft. Moreover, it reduces the maintenance labour and cost. NOTE: power factor is 0.97 after the reform contrast to 0.85 before. From the chart, we can see the energy saving effect decreases as the boiler's load increases, and vice versa. But it runs about 8 months at 140~150t/h, 2 months at 200t/h, 1 month at 180t/h, 1 month for maintenance. There is about 9219822 kWh saved in a year, Power saving rate is about 49.5%. If we take account of the power price, we can recover all the investment in less than a year. The reform was one of the most important projects in our corporation in 2006. It is the practical measures that our management changes from extensive form to conservative-minded form. It is embodiment of managers' forward-looking awareness. The benefits from the reform inspires the staff enthusiasm, and makes us know the importance of energy saving. The perfect economic performance indicates the great potential of energy-saving.